What makes this a Swedish cake? Hmmm ... that's the question I asked myself. The ingredients are familiar enough, some versions include cardamom, but then again, that's only for the culinary adventurous ones. Is it the almonds accompanying them? Possibly. Is it the way the apples are grated (or sliced in my case) to be incorporated with the batter? Maybe. But since I couldn't find a good enough answer to what makes this apple cake Swedish, I concluded that it is just a dessert they love, and make often, in their cold Nordic kitchens when fall comes around. I also asked a Swede, who was just as clueless as I was as to why this cake is specifically Swedish. LOL! 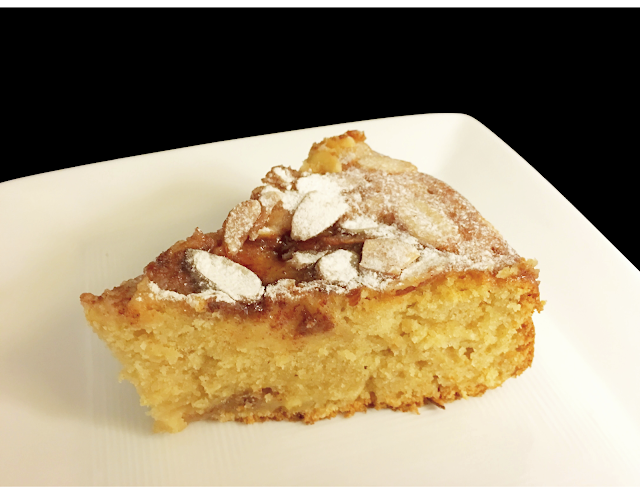 Now that we got that out of the way, and you won't have to think why it is a Swedish apple cake, instead of a Finnish apple cake, or maybe a Norwegian apple cake, let me tell you a few good reasons why you should give this a try. First ... it's Swedish. And if you haven't made anything Swedish before, you can head to your nearest IKEA and try their meatballs. Then you can make this Äppelkaka med mandel which translates to apple cake with almonds. Then ... let's get to the cake itself, which is a moist yet light batter, specked with bits of diced apples in it and cinnamon-scented sliced apples on top. 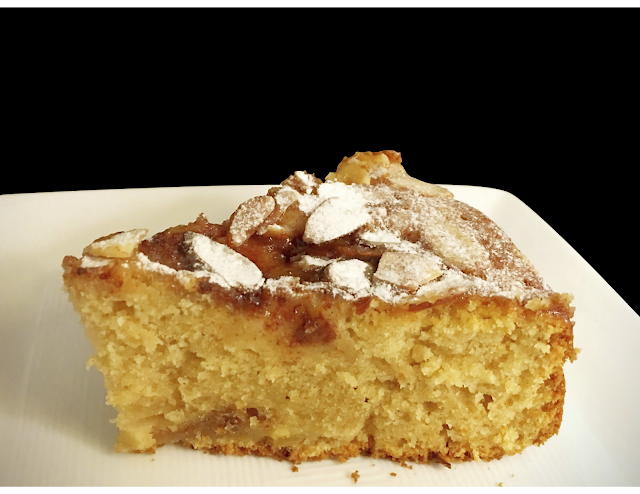 To offset the soft and melt-in-your-mouth apples, we added a good dose of toasted almond slices for a lovely contrast of texture. As with most Swedish recipes I went through, this cake isn't overly sweet, and may be accompanied with a vanilla custard or a scoop of ice cream. Finally ... it's fall, and there are a bunch of apples sitting on your counter, and you shall depart from the familiar territory of apple pie, apple crisp and applesauce, and make something your Swedish neighbour would be proud of. 1. Thinly slice 1 of the apples, and dice the other 2 apples. 2. In a small bowl, mix the 2 tbsp sugar with the 1 tsp of cinnamon and coat the sliced apples with this. 4. Butter and flour a 23 cm or 9 inch springform pan. 5. In a large bowl, on medium high speed, beat the butter with the light brown sugar until it has increased in volume and paled in colour. 6. While the butter and sugar is beating, sift the dry ingredients together onto a medium bowl: flour, baking powder, cinnamon, cardamom, and salt. 7. To the butter and sugar mixture, add the eggs, one at a time, scraping the sides of the bowl if needed, followed by the vanilla extract. 8. Reduce the speed to low, and add the diced apples. 9. Add the flour in 3 increments, mixing until just combined. 10. Transfer the batter to the prepared pan and smooth out the surface. 11. 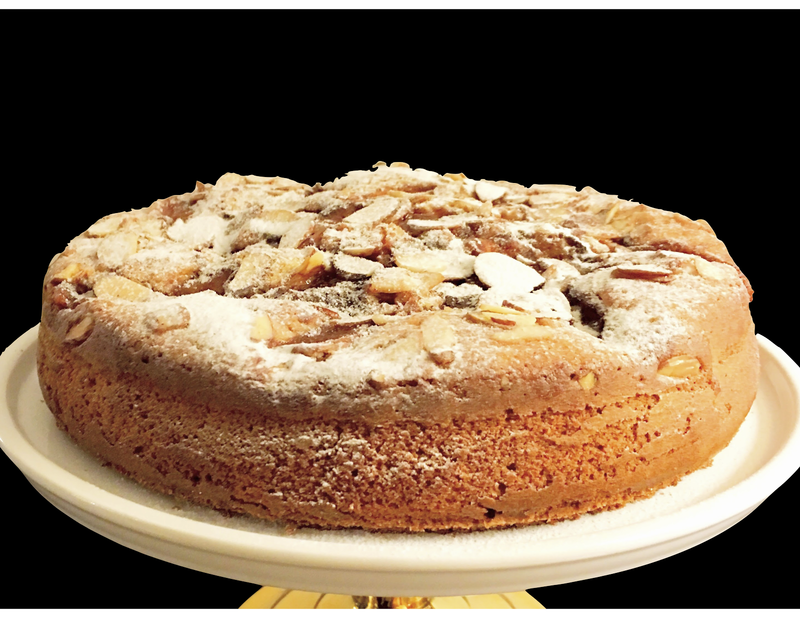 Place the apple slices (that were dusted with cinnamon sugar) in a circular pattern then scatter the sliced almonds on the surface of the cake. 12. Bake for 60 - 70 minutes until a skewer inserted in the centre of the cake comes out clean. 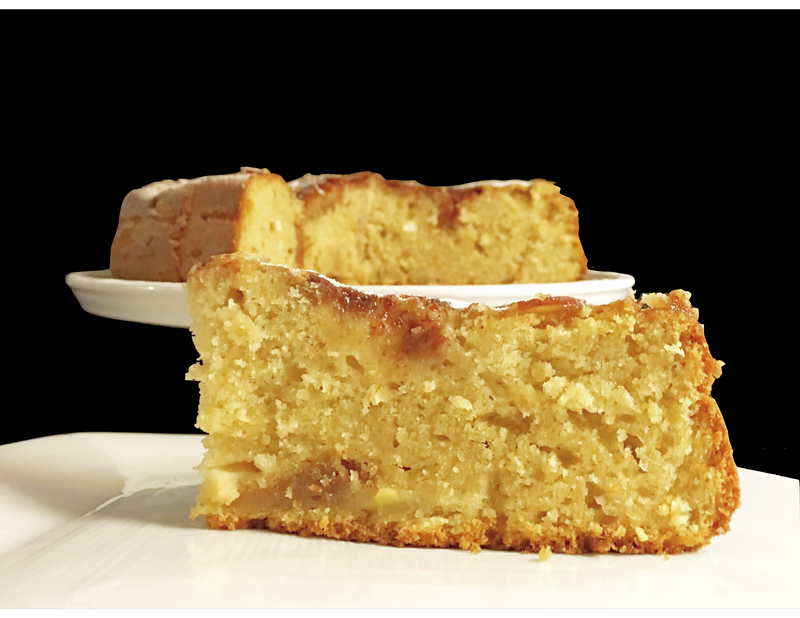 You may want to cover the top of the cake with aluminium foil at the 40 minute mark to prevent the top of the cake from over-browning. 13. Cool the cake in the pan for 15 minutes before unmolding it onto a cooling rack to cool completely. 14. Strain the jam or jelly into a saucepan with 2 tbsp water and bring to a soft boil. 15. 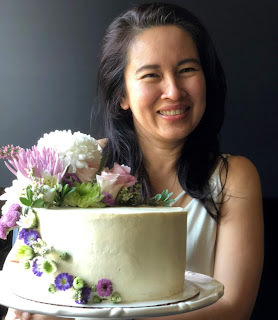 Brush the glaze on the surface of the cake when the cake has cooled.